Footprints from (A) a modern human walking normally, (B) a modern human walking with a stooped posture known as the "bent knees, bent hip," or BKBH, posture, and (C) 3.6 million-year-old hominin footprints found in Laetoli, Tanzania. The team's analysis suggests ancient hominins probably walked in a way that is very similar to modern humans. Credit: David Raichlen, University of Arizona. Ever since scientists realized that humans evolved from a succession of primate ancestors, the public imagination has been focused on the inflection point when those ancestors switched from ape-like shuffling to walking upright as we do today. Scientists have long been focused on the question, too, because the answer is important to understanding how our ancestors lived, hunted and evolved. A close examination of 3.6 million year old hominin footprints discovered in Laetoli, Tanzania suggests our ancestors evolved the hallmark trait of extended leg, human-like bipedalism substantially earlier than previously thought. "Fossil footprints are truly the only direct evidence of walking in the past," said David Raichlen, PhD, associate professor at the University of Arizona. "By 3.6 million years ago, our data suggest that if you can account for differences in size, hominins were walking in a way that is very similar to living humans. While there may have been some nuanced differences, in general, these hominins probably looked like us when they walked." Raichlen will present the research at the American Association of Anatomists annual meeting during the 2018 Experimental Biology meeting, held April 21-25 in San Diego. The species that comprises modern humans, Homo sapiens sapiens, emerged roughly 200,000-300,000 years ago. The genus Homo is thought to have emerged about 2-2.5 million years ago. The term hominin is used to refer to a broader set of ancestors that existed before that, although there is debate about the nature of the species included in that grouping and the relationships among them. It is thought that hominins began walking on two legs around 7 million years ago, but based on the way other primates evolved, it is considered likely that these early ancestors retained a crouched, bent-legged walking posture for some time. 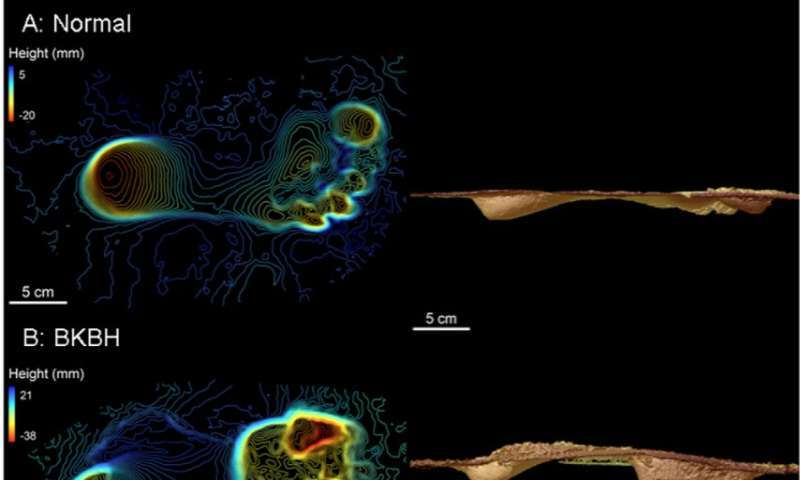 Raichlen and his team use a variety of methods to reconstruct walking mechanics based on fossilized footprints and skeletons of early human ancestors. Their most recent results use a combination of experimental data and morphological studies to show that the footprints at Laetoli are consistent with fully upright, human-like bipedal walking. In one experiment, the team compared the depth and shape of the Laetoli footprints to those left by eight volunteers—modern humans—walking in either an upright or stooped posture (in which the knees and hips are bent). When they analyzed the impression made by the toe versus the heel, which reflects how the center of pressure moves along your foot as you take a step, they found the footprints at Laeoli were much more similar to the footprints made by modern humans walking upright. Walking upright with the legs fully extended uses less energy than bipedal walking in a more ape-like crouched manner, allowing one to endure longer journeys. This suggests that the switch to a more human-like gait likely had something to do with how our ancestors found food—and how far they had to travel to find it. Although the evidence is strong that hominins were walking upright by 3.6 million years ago, the exact stage when the locomotion of our ancestors diverged from that of modern-day apes remains unknown, Raichlen said. Answering that will likely require following in more—even older—footprints. More information: David Raichlen will present this research on Sunday, April 22, from 4:30-5 p.m. in Room 11B, San Diego Convention Center (abstract). The footprints found on Crete from 5.7 million years ago seemed to show modern foot and gait before they were destroyed.